A farmer wants the donkey to take the load and travel. But, the donkey does not move. So, he ties a carrot to the donkey similar to the above. 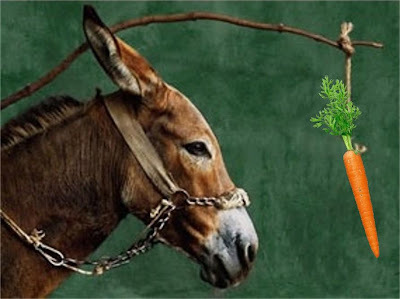 The donkey wants to eat the carrot and moves forward. At the same time, the carrot also moves by the same distance. The donkey cannot eat the carrot, till the farmer reaches his destination. Whenever anybody says, they are doing something because, otherwise, their performance review would be effected, I remember the above. 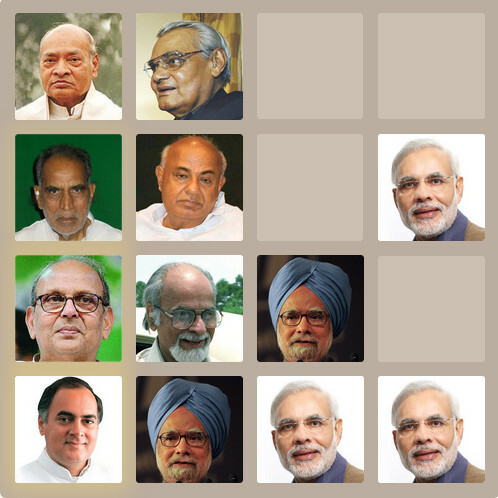 I have seen many people who are sacrificing themselves, so that, they can get better rating in the performance review. They work a lot on weekends and late nights, eventhough, they are not interested in doing that. Sometimes, the manager asks for something which may impact the project negatively. To do not effect the performance review, they agree to the manager, which causes loss to the company. If one does not take enough rest, or force oneself to work more, then the productivity would go down. The correct thing is improving the productivity and not increasing the no.of working hours. Unfortunately, many managers do not follow that. They fear that, they may not get another job. If that is the case, then first they should concentrate on acquiring more skills so that, they can get another job, rather than just blindly following the manager. If they don't acquire more skills, then it may have more negative impact in the long run. Not everyone can get promotion. Most of the companies won't give promotion to more than 20% of the people per year. In that case, for everyone to get promotion, it would take minimum 5 years. In case of relative ranking, many people try to push down others, or would try to prove that, others are wrong. This creates a bad environment among the colleagues, if everyone is trying to get better rating in the performance review. If one wants more salary, the best thing is, change the company every 3 years. If one tries to satisfy the manager to get better performance rating, then that does not do any good for oneself or the company. If you think even 3 years is long time to stay in the company without listening to the manager for everything, then prolong as much as possible. Increase the estimates, let them think that you are less productive, and keep enough liquidity to survive for 3-4 months. Don't resign just because, the review is little bad. Resign after 3 years, or if there is no point in continuing in the same company. Work for yourself and Work for the company. Do not work for anybody or anything else. There is very bad code in the project. The developer was asked for explanation on writing bad code. The Developer blames the Development Manager for giving less time to finish the project. The Development Manager blames the Program Manager for giving too many requirements without giving enough time. The Program Manager blames the Director that, he forced to fulfill all the requirements of the client within the time frame set by the client. The Director says, he was ready to provide more resources to the Development Manager, but, the Development Manager rejected it saying, "Nine women cannot produce a baby in one month", and he could not increase the time because of the constraints from the Vice President. The Vice President says, he does not have an option, because, he has pressure from the CEO to become market leader in couple of months. The CEO says, "What is the issue with the code? It is solving our problems".